Five finger Tees is an online shop that has the funniest tees I have ever seen. It has definitely become one of my top favorites. They have a huge variety of designs to fit everyone's personality and they are SO affordable you will want to buy a lot in one order. The Five Finger Tees T-shirt I received for review is based on one of my favorite shows from the past year, Breaking bad. If you don't know the show then you won't get the funny of the tee, so let me explain. Breaking bad is a tv show based on a chemistry teacher who receives the dismal news that he has cancer. He wants to be able to provide for his family when he dies, so what does he do? What he does best, but in a way that makes more mula. He takes his chemistry to drugs and starts making his own meth to sell. It's really an excellent show,and I wasn't even that interested until I started watching at the recommendation of a friend. Then, I was hooked. This is perfect for any lover of the show. 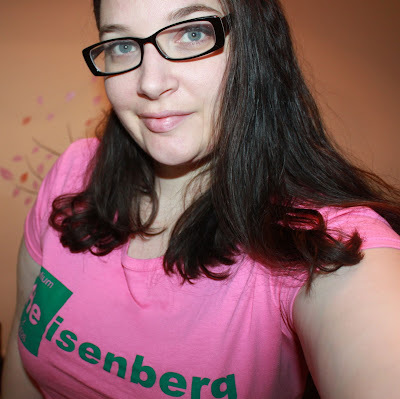 So this tee shirt plays off of the chemistry side of things. He stands for Helium on the chemistry chart and it just happens to be the first two letters in the lead characters name. As soon as I saw it I chuckled with glee. It's right up my brain alley and so are a ton of other shirts on their site. I bought this in pink, but it was a much hotter pink than expected, though my eyes adapted and I kinda like it. (Much brighter than the this pic conveys with flash) The biggest thing I love about this place is that you have the freedom of choosing from a variety of colors. I hate being stuck with one color for a T-shirt, which is why I love this! Aside from the color being a lot brighter than pictured, it is great quality for $12 and actually fits like the size I ordered! A woman's Large was entirely accurate and I was so thankful for that. It's also comfy, not at all scratchy like a lot of cheaper t-shirts are. It's not super soft like an AA shirt, but I can tell they use good quality 100% cotton for their prints. It really shows in the print as well, as that came out excellent too. I highly recommend Five Finger Tees for all your t-shirt and hoodie desires. You'll be amazed. They really do have everything. I also recommend if you're buying as gifts for more than one person or yourself, to take advantage of their free shipping when you spend $50! Have fun browsing, I know you will. You can also check them out on Facebook for the latest promotions and FREE T-shirt Giveaways! Guess what? GIVEAWAY time! 1 FREE T-shirt for one lucky person! GOOD LUCK! Cute shirt & it sounds like a good show! I just might have to check out what other tees they have to offer based on the price & how well they fit. cute shirt and one of my favorite shows too! I LOVE breaking bad!! Totally rock that tshirt too. =) Looks great! I love the T-Shirt and it looks awesome on you, and Braking Bad rocks! Ohh I love your pink shirt!! I want one like that too!